It’s summertime and a burger sounds pretty good!As you head to South Padre Island or to a backyard barbeque, you can wow your friends with this low calorie, low fat entree! Here is a STUFFED burger that’ll keep you work you on track to “slim and trim”. 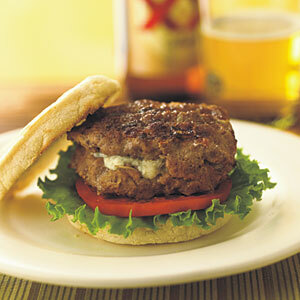 Blue Cheese Stuffed Burgers are packed with a whopping 31+ grams of protein and they under 350 calories. The healthy eaters over myrecipes.com came up with a simple dish with amazing flavor. Coat a small nonstick skillet with cooking spray; place over medium heat until hot. Add onion; sauté 5 minutes or until tender. Remove from heat; let cool. Combine onion, beef, breadcrumbs, water, and egg white in a large bowl; stir well. Divide mixture into 8 equal portions, shaping into 1/2-inch-thick patties. Spoon 1-tablespoon cheese into the center of 4 patties; top with remaining patties. Press edges together to seal. Prepare grill. Place patties on grill rack coated with cooking spray; grill 4 minutes on each side or until done. Spread 1-tablespoon sour cream over top half of each muffin, and set aside. Line bottom halves of muffins with lettuce leaves; top each with a tomato slice, a patty, and top half of muffin. Even the summer heat can’t slow you down! Copyright © 2014 South Padre Island Marathon. All Rights Reserved.